May is an exciting month for wildlife lovers as it is the time when new things take place. The trees become covered in leaves, flowers appear and the birds start producing and rearing their young. 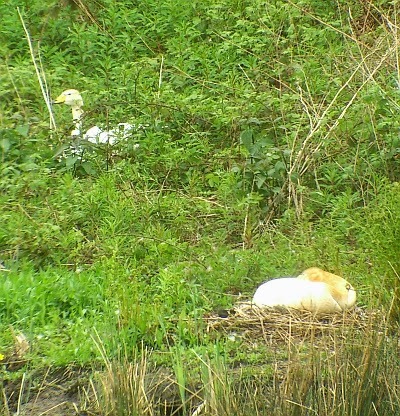 Down at my local bird pond the Mute Swan was still sitting on her nest. 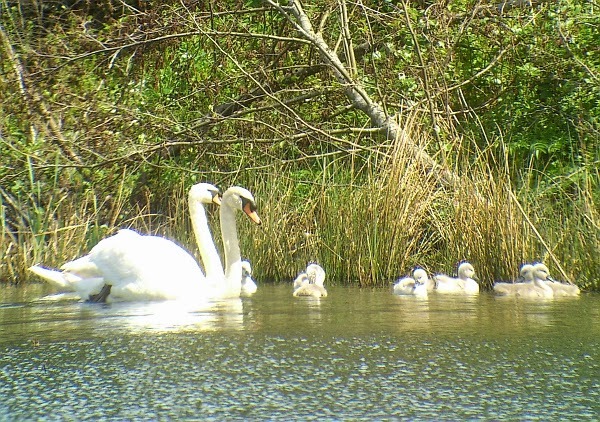 Hopefully in the next week or so she will be on the pond with her cygnets. 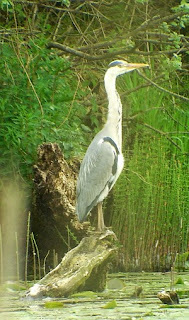 The Heron was on its usual post on the pond. On the other pond, a Mute Swan was also sitting on her nest but there was no sign of her mate. 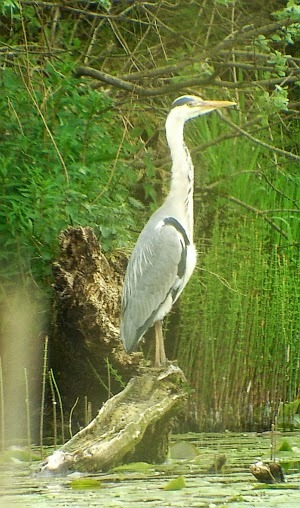 I will keep an eye on this pond to see if the male re-appears. Hopefully no harm has come to him. Walking along the banks of the River Avon we stopped to have a look over the river with our binoculars. A ripple could be seen in the water but no birds were in sight. As we looked we could see an otter's head appear briefly on the surface before disappearing again. Unfortunately we were unable to get a photograph of it. As we left the path beside the riverbank we heard a screeching noise in some bushes. As we walked over to see what was causing the noise, two small Polecats appeared with one chasing the other. The one in the rear gave up the chase after a short time allowing the one on the front to disappear into some bushes ahead. 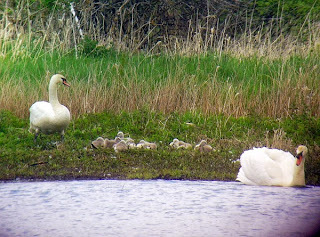 Our next port of call was the large pond with the nesting Whooper Swan. 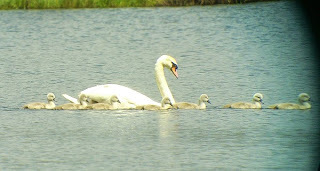 On our previous visits we have only seen the female Swan but today the male was present. What is unusual about these birds is that they migrate to Iceland at the end of March to breed. However, there are a few Whoopers remaining in the area probably due to them being unable to make the long journey to Iceland. Over on the other side of the pond, a family of Mute Swans were having a rest on the grass next to the water. The male Swan decided to take to the water (see above photograph) and as he started swimming, it became apparent he was making for the island where the Whooper Swans were living. "Just going to sort out these Whooper Swans"
After swimming a short distance, the Mute swan started flapping his wings and flew to the island with the Whooper Swans. Mute Swan (front) chasing the Whooper Swan. 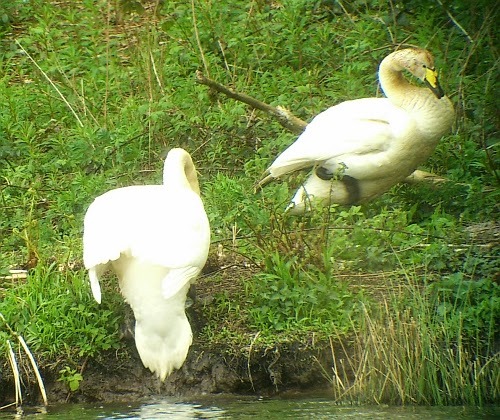 He then started attacking the male Whooper Swan. At one point the pair flew over to where we were standing .The long grass prevented us from seeing what was happening, but it sounded quite a vicious encounter. Eventually the Mute Swan flew off and after a few minutes the Whooper Swan's head popped up from the long grass and he flew back to his island home. 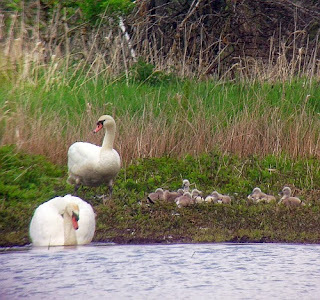 The Mute Swan then attacked him again before being joined by the female Mute Swan and the cygnets. The Mute Swans then all swam off together, leaving the Whooper swans in peace. The other birds on the pond were swimming peacefully and not showing any signs of aggression towards the other birds. These included Great Crested grebe, Coot, Canada Geese and Greylag Geese. It had been an eventful day.